by Elizabeth Esten Appearances can deceive, as we can see with the way modern audiences view films marketed for children. Sure, things like the totally necessary Minions movie or the recent Angry Birds feature don’t help, but that doesn’t mean that in today’s modern age of animation we can’t make these movies smart. Some can even defy expectations and blow audiences away. This is the case with Zootopia, which is so much more than your standard talking-animal movie. Judy Hopps (Ginnifer Goodwin) is a rabbit living in a small town who dreams of becoming the first bunny cop not only in her family, but in the history of the police force. 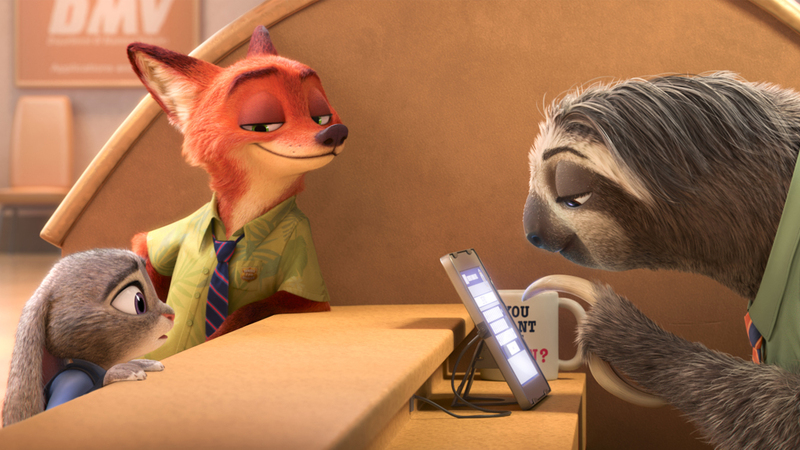 After graduating at the top of her class, Judy is assigned to work in the city of Zootopia, where she encounters a scheming fox named Nick Wilde (Jason Bateman). When she is assigned a missing otter case and given only 48 hours to solve it, Judy recruits Nick to help her find clues. Along the way, the pair discovers a greater truth that could tear apart the city as the world knows it. While straight and to-the-point on the surface, the story of Zootopia is better constructed than any recent animated film I’ve seen. Some of the beats are as predictable as the presence of explosions or female objectification in a Michael Bay film, but I can forgive the filmmakers for a lot of reasons. Yes, the classic “third-act breakup” is unnecessary as hell and only slows the movie down; but all of the elements surrounding it are so well done that it’s easy to chalk up the more predictable beats of the narrative to the writers wanting to ensure that the film will appeal to a mass audience of eight-year-olds and their parents. The overall “lesson” of the film is to always believe in yourself and aspire to accomplish more than what society expects. We’ve heard this 30,000 times before, but Zootopia makes it fresh by adding to this idea with elements found in contemporary society. With its subtle incorporation of real world issues like racial tension and even the gender gap, the film makes the viewer really think about heavy matters without even realizing it. This is the real benefit of seeing Zootopia as an older viewer, but this also implants the idea of equality into the minds of the younger viewers that the film is clearly marketed towards. The theme of equality is exemplified in how Judy is constantly undermined by her fellow police officers, especially Chief Bogo (Idris Elba). She’s not belittled because she lacks the skill, though — for her peers, the mere concept of a small bunny fighting crime is so preposterous that they don’t even give her a chance. The subtle thematic development is my favorite story element by far. It shows that just because a movie is made with a child in mind, doesn’t mean that it needs to dumb down the message or the humor. The animation overall is wonderfully done, as expected. The action sequences have a great kinetic energy to them, but they don’t forget to slow down for the smaller character moments between Nick and Judy. The universe of the film is really well-thought-out as well. Directors Byron Howard and Rich Moore spent almost a year researching not only the animals themselves, but also how animals of different ecosystems could co-exist in the same city and what everybody would need to thrive. The film does great things with the scale of animals and the size of their buildings and towns, such as in one scene that is set in an area built for shrews and mice. The characters we follow are equally as important as the universe of the film itself and the characters of Zootopia are brilliantly crafted. Judy Hopps could be considered a typical Disney dreamer, a character who desires to achieve more than what society deems acceptable for someone in her position. But compared to other characters like her, Hopps has a determination and optimism in her outlook that is deeply refreshing in a world full of cynicism. She never comes off as disingenuous and she is easy to connect with, therefore viewers want her to achieve her dreams. Similarly, Nick Wilde is a one-dimensional sidekick character on the surface, but there’s a lot more to him than that. He mainly exists to help punctuate the message of the film, but he doesn’t go to waste at any point. Him and Judy have a terrific sense of camaraderie throughout and more importantly, their relationship remains platonic from beginning to end. This a small thing, but it’s a wonderful change of pace to not have a romantic relationship squeezed into a narrative for no reason. The phenomenal voice-acting further solidifies the characterizations, with the standouts being Goodwin, Bateman and J.K. Simmons in a smaller role as Mayor Lionheart. Zootopia showcases some of Disney Animation’s best work in years, thanks to a fantastic story, unique characters and a message that every young child should learn.